In May and June, when asparagus is in season, it seems to make its way onto the dinner menu almost every night. Grilled on the BBQ, lightly roasted in the oven, tossed with other veggies in a stir fry, or added to green salads – there are so many ways to enjoy it. 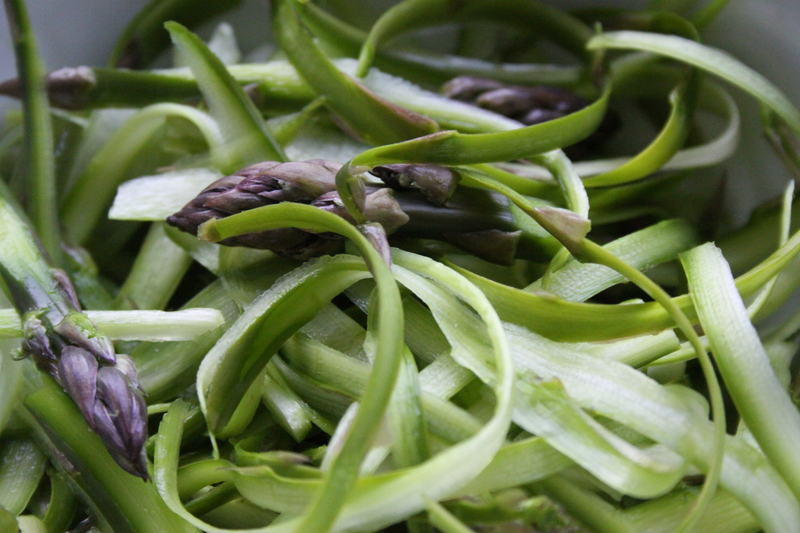 But one of my favourite is this very simple, raw asparagus salad. It’s light, has a nice crunch, and requires only a few ingredients. Rinse asparagus. Snap stalks to naturally separate the tender top portion from the more fibrous bottom. You’ll only need the stalk tops for the salad, but you can save the bottoms the making asparagus soup later. Using a vegetable peeler, starting below the tip, carefully peel down each spear to create long thin ribbons. Transfer ribbons and tips to a serving bowl. Toast pine nuts. You can do this on the stovetop in a pan over medium heat, gently shaking the pan every so often to keep from sticking or burning, or in the toaster oven on a light toast setting. This is not something you can do while multitasking with something else. Pine nuts are sneaky. They will burn easily and quickly, so keep your eye on them. To make the cheese shavings, use your vegetable peeler to shave thin slices of Parmesan about 3cm (1 inch) long. Combine asparagus, pine nuts, cheese and salad dressing and serve.